CrossRoads: A Southern Culture Annual is a publication dedicated to the interdisciplinary study and artistic appreciation of the South (broadly defined) and Southern culture. 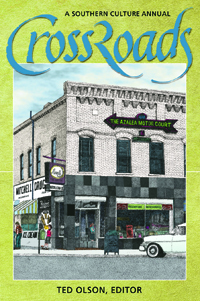 Published annually, CrossRoads continues the editorial approach of CrossRoads: A Journal of Southern Culture, a semi-legendary periodical originally published in the early 1990s by a dedicated group of graduate students affiliated with the University of Mississippi’s Center for the Study of Southern Culture. The scholarly work in the second volume of CrossRoads (2005) explores such topics as Southern language, literature, visual art, music, and food, and that volume features scholarly work by Donald Davidson, Donald Edward Davis, Fred Sauceman, Robert Hawkins, Emily Loop, Ryan A. Brasseaux, Annabel Alderman, Kathryn Bright Gurkin, Eric Jarvis, David Anderson, Lynn Zimmerman, Peter Schmidt, Fred Waage, Margaret D. Bauer, and M. Thomas Inge. That volume also contains compelling creative work from R. T. Smith, Jeff Daniel Marion, Laura Payne Butler, Van Henderson, Adam Tavel, David Huddle, Tony Morris, Judy Loest, Stephen Newton, Chavawn Kelley, Ronnie Johnson, Bill Scalia, Freda Fuller Coursey, James Charles Fox Jr., Gerald Thurmond, Jeff Biggers, William Walsh, Dory L. Hudspeth, Thomas McConnell, Jerry Peterson, Thomas Burton, Connie Jordan Green, Linda Parsons Marion, and Matthew Jackson Michael. Works by visual artists Suzanne Stryk, Robert McDonald, Abigail Hahn, Bart Galloway, Nathaniel Welch, and Warren Kirbo are also included in that volume of CrossRoads.